Vitamin D is the generic term used to designate Vitamin D2 or ergocalciferol and Vitamin D3 or cholecalciferol. Humans naturally produce Vitamin D3 when the skin is exposed to ultraviolet sun rays. Vitamin D3 is mostly metabolised by the liver into 25-Hydroxyvitamin D3 (25-Hydroxy D3) which is the main form of vitamin D circulating in the body. 25-Hydroxy D3 is a precursor for other vitamin D metabolites and also has some limited activity by itself. The most active derivative is 1,25-hydroxyvitamin D3, produced in the kidney (or placenta) by 1‑hydroxylation of 25-Hydroxy D3. 25-Hydroxy Vitamin D stimulates the intestinal absorption of both calcium and phosphorus and also bone resorption and mineralisation. 25-Hydroxy Vitamin D might also be active in other tissues responsible for calcium transport for example; placenta, kidney, mammary gland and' endocrine glands such as the parathyroid glands and beta cells. Vitamin D3 and vitamin D2 are also available by ingestion through food or dietary supplementation. As vitamin D2 is metabolised in a similar way to Vitamin D3, both contribute to the overall Vitamin D status of an individual. This is the reason why it is very important to measure both forms of 25-Hydroxy Vitamin D equally for a correct diagnosis of Vitamin D deficiency, insufficiency or intoxication. Vitamin D deficiency is an important risk factor for rickets, osteomalacia, senile osteoporisis, cancer and can have an effect on pregnancy outcomes. The measurement of both 25-Hydroxy Vitamin D forms is also required to determine the cause of abnormal serum calcium concentrations in patients. Vitamin D intoxication has been shown to cause kidney and tissue damages. 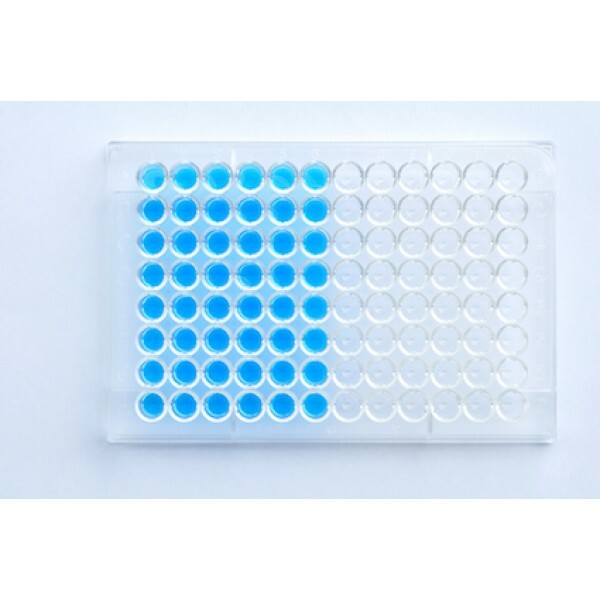 The Demeditec 25-Hydroxy Vitamin D Total ELISA is a solid phase Enzyme Linked Immunosorbent Assay (ELISA) performed on microtiterplates. During a first 2 hours incubation step, at room temperature, total 25-Hydroxy Vitamin D (D2 and D3) present in calibrators, controls and samples is dissociated from binding serum proteins and bound to binding sites of a specific monoclonal antibody. After 1 washing step, a fixed amount of 25-Hydroxy Vitamin D-labelled with biotin in the presence of horseradish peroxidise (HRP), compete with unlabelled 25-Hydroxy Vitamin D2 and 25-Hydroxy Vitamin D3 present on the binding sites of the specific monoclonal antibody. After a 30 minutes incubation at room temperature, the microtiterplate is washed to stop the competition reaction. The chromogenic solution (TMB) is added and incubated for 15 minutes. The reaction is stopped by the addition of the Stop Solution and the microtiterplate is then read at the appropriate wavelength. The amount of substrate turnover is determined colourimetrically by measuring the absorbance, which is inversely proportional to the total 25-Hydroxy Vitamin D (D2 and D3) concentration. A calibration curve is plotted and the total 25-Hydroxy Vitamin D (D2 and D3) concentrations of the samples are determined by dose interpolation from the calibration curve.